Challenge your class with a creative writing activity that will teach your students how to compose a character sketch. Have students complete their character sketches as their preliminary draft. Ask students to bring in clean, recyclable materials that they can use to build life-size models of their characters. Encourage them to bring in as many different shapes, textures and colors as they can find. Students should focus on developing identifiable traits for their character. For example, if a student chooses Harry Potter, they would want to include a lightning scar and glasses with round lenses. For traits that are not physical (bravery, intelligence, etc), students should come up with objects to represent that trait. Reinforce the concepts of innovation and idea generation as part of the creative process. If needed, students can use Legos, K'nex or other building blocks to create small models of their intended life-size characters to help them plan. Depending on grade level and size of your classroom, scaled-down models may be used in place of life-sized ones. Depending on grade level and size of your classroom, students can complete this in groups instead of individually. 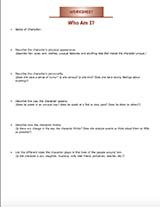 Have students compile a list of 15 questions and answers for their quiz based on their character sketches. Students should then put their quizzes online using one of the tools mentioned above. Warn students that they should limit the possible answers to make the creation of the quiz as easy as possible. Students should then trade sketches and quizzes.